Cardamine parviflora is an annual or biennial, stems mostly solitary, to 30 cm tall. Leaves alternate, pinnate, to 4 cm long with 3-6 pairs of leaflets, leaflets of rosette leaves sparsely toothed. 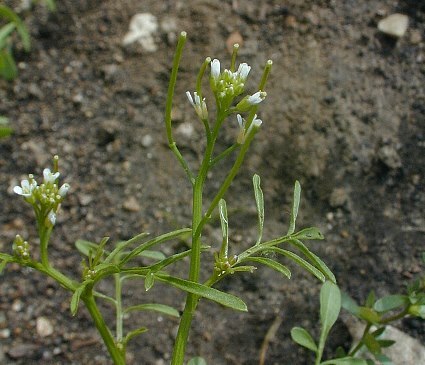 Flowers white, 4-parted, petals to 0.3 cm long. Fruit capsules to 3 cm long, less than 0.1 cm wide, seeds 26-46, less than 0.1 cm, April-Aug.
Habitat: Dry sandy soil, sun or shade.